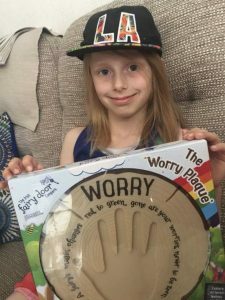 We know lots of our Pals suffer from anxiety, even those who don’t have worries so in June we decided to have a worry themed month. 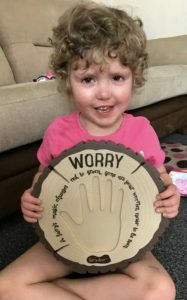 Depending on a child’s age and likes we sent fairy worry plaques, worry monsters or creative journals. 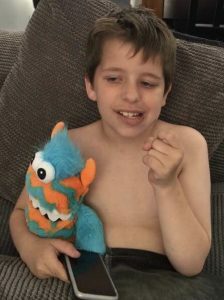 “Malachi has been suffering with Mental health issues for over a year and he is under the national Camhs team because our local services assessed him as being “to complex” as he was diagnosed with suicidal ideation, he’s also under weekly private counselling he hasn’t been in school since before Easter due to anxiety & stress causing him serious physical health problems but today this little worry monster turned up on our doorstep sent by Post Pals! What a blessing this is as Malachi decided he could put his worry’s in and once the monster has eaten them all up he will zip the mouth shut and there gone then once his belly is full malachi with my help will burn the worries away! What an amazing fantastic little practical way to help him, with all the top professionals involved this has got to be the best practical way we have had to help him!